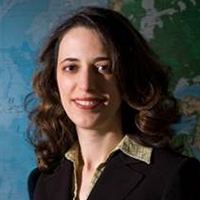 Pinar Keskinocak, Ph.D. is the William W. George Chair and professor in the H. Milton Stewart School of Industrial Engineering, and co-founder and co-director of the Center for Health and Humanitarian Systems. She also serves as the College of Engineering ADVANCE Professor. Previously, she worked at IBM T.J. Watson Research Center. Keskinocak received her Ph.D. in operations research from Carnegie Mellon University and her M.S. and B.S. in industrial engineering from Bilkent University. Keskinocak's research focuses on the applications of operations research and management science with societal impact, particularly health and humanitarian applications, supply chain management, and logistics/transportation. Her recent work has addressed infectious disease modeling, evaluating intervention strategies, and resource allocation; catch-up scheduling for vaccinations; hospital operations management; disaster preparedness and response (e.g., prepositioning inventory); debris management; centralized and decentralized price and lead-time decisions. Keskinocak has worked on projects with companies, governmental and non-governmental organizations, and healthcare providers, including American Red Cross, CARE, CDC, Children's Healthcare of Atlanta, Emory University, and Intel Corporation. She currently serves as a department editor for Operations Research (Policy Modeling and Public Sector area), associate editor for Manufacturing & Service Operations Management, and secretary of INFORMS. Previously, Keskinocak served as INFORMS Vice President of Membership and Professional Recognition; is the co-founder and past-president of INFORMS Section on Public Programs, Service, and Needs; and the president of the INFORMS Health Applications Society.